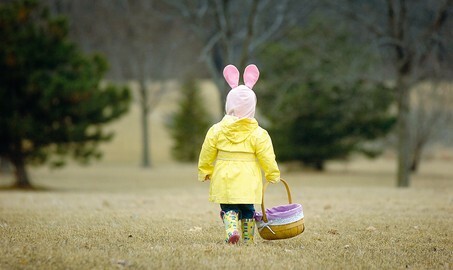 If all you've planned for the Easter break with the family this year is a hot cross bun feast and a morning bunny surprise perhaps you should add fresh air (chocolate) in the country. Green & Blacks and the Soil Association have organised a whole lot of Easter egg hunts at a whole host of organic farms across the country. After the kids have sniffed out as many organic choccy eggs as they can handle they can watch a cow being milked and feed some of the animals. Nearly 40 farms are participating and they will all have different activities from egg decorating to fancy dress competitions to tractor rides to hot cross bun making. Some of the farms have woodlands others have coastal trails but all offer a bit of fresh air. Yes the air may have a touch of cow in it but nonetheless its organic cow is likely to be fresher than a city park. For full details of all the organic farms participating in this great Easter egg hunt visit the Soil Association's Easter web page.